This small barrel organ was made between 1798 and 1815 when George Astor was running a music shop from his ‘warehouse’ at 79 Cornhill in the City of London. These organs were made for the rapidly expanding middle class market, a sort of Georgian juke box, with popular tunes of the day. In this case there are marches and popular soldiers’ songs, appropriate to a time when Great Britain was fighting a war against revolutionary France. There are the usual Scottish folk songs, one or two English folk songs and a couple of waltzes. They are supplied on three barrels. The stops are: Stop Diapason, Principal, Twelfth, Fifteenth, drum and triangle. They have to be chosen by the player. This organ has spent some of its life with the owner’s family in the USA, which is not inappropriate, for George’s younger brother John Jacob Astor, after learning English while working in his brother’s business in London, became the first multi-millionaire in the US. 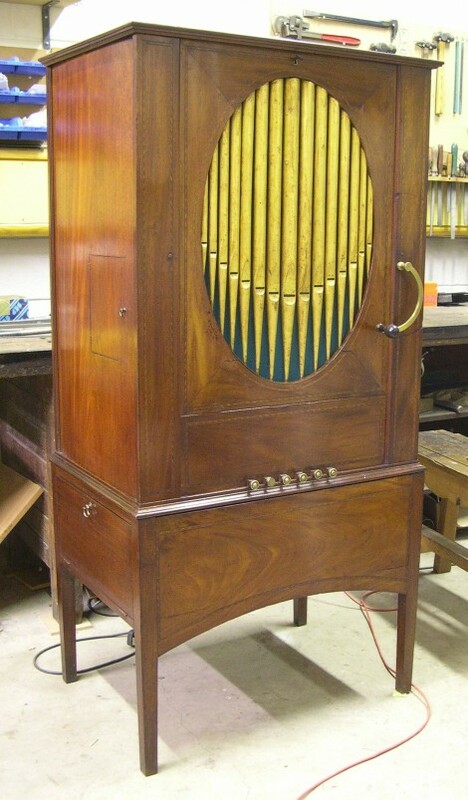 This is the third Astor barrel organ that we have restored, including one for English descendants of John Jacob’s family. The organ was restored in 2007 by Stuart Dobbs, with Charles Marsden restoring the finish of the casework. The organ had suffered a bit from its travels to and fro across the Atlantic, but there was no fundamental damage from bugs or inappropriate environment.